After five days, the Everclear is distinctly yellow-tinged, and the aroma is citrusy, though the taste is still pure hooch. 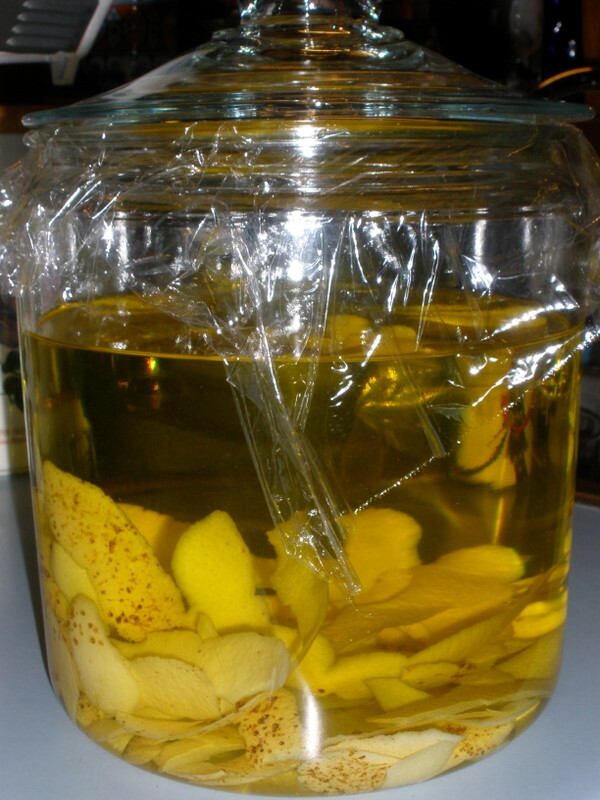 The brown blemishes on the peels are slight imperfections caused by bird pecks: some limoncello recipes stress the need for blemish-free peels, claiming that any imperfections cause bitterness. But, I don’t have any “perfect” lemons. I figure that an italian peasant wouldn’t have skipped making limoncello this year just because birds pecked all of his lemons. If the finished product turns out bitter, I’ll know why, and I’ll savor the flavor as a mark of terroir! Limoncello quest documents one person’s exhaustive efforts to make limoncello, along with a few nice recipes. Looks great. I just made a big batch of Meyer Lemon limoncello myself. It only took a week for the Everclear to leach out all the color. I wonder if I left it in there long enough? How does it taste? My batch has been steeping for a week, but it’s still not very lemony–just hooch-y, like plain Everclear. After next week, I might add more lemon peels…the color is still darkening, day by day. I’ve left the peels in the everclear for as long as 4 months before but I’ve never seen peels get truly brittle. They do bleach out to nearly white long before that though. My has a light, nice lemon flavor. Even after I added the simple syrup, though, I had to add some water. The everclear taste was too strong. I have a recipe for limoncello and strawberry ice-cream, from the chef Gennaro Contaldo. It is bloody delicious – I made it for a dinner party a couple of months ago. Email me if you want it and I’ll dig it out.